There is no Stonework course scheduled for 2018. Please contact the school at info@isba.ca for more information or to express interest. Learn the art of block and stone work as master stone mason Chris Bell takes you though the process of building a Rumford fireplace from foundation to stone finish. 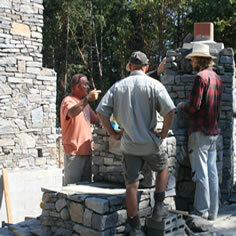 This course will give you the basics in block and stone construction from building foundations to fireplace details. This course proves to be a creative progression to expand the wood workers skills and creativity. The skills developed in this course can be applied by those who have the desire to learn proper techniques in this art to add that extra special touch to your project or employment prospects.